Coffins, or funeral caskets, are containers in which the dead are buried. Burial practices differ markedly across cultures and through history, but many peoples have used wooden, stone, or metal boxes for burial. Beautifully decorated stone boxes called sarcophagi were used in ancient Egypt. Stone coffins were also used in Europe in the Christian era, and later lead or iron coffins became common. Only wealthier people could afford elaborate coffins, and in Western cultures since the Middle Ages, poorer people were buried in simple wooden boxes. The very poor had no coffins at all, and might be laid in the grave wrapped in a blanket. The making of a wooden coffin is not significantly different from any other type of carpentry or cabinetry. In some parts of the world, skilled carpenters specialize in elaborate coffins. Italy has a vanishing tradition of hand-built burial caskets, and master crafts-men in Ghana continue to create coffins in fanciful shapes such as birds, cars, and ears of corn. In the United States, coffins were traditionally built only as needed, by the local carpenter. The carpenter "undertook" to take care of the deceased, hence the origin of the term undertaker. Over the past 50 years, the coffin industry in the United States has become increasingly centralized. A few manufacturers with large, automated plants now dominate the market. The same phenomenon exists in Canada and the United Kingdom as well. In reaction to this centralization, many small casket makers have recently tried to reach the public directly, selling coffins either through showrooms, by mail, or over the Internet. Some alternatives to the conventional coffin have also arisen. One small manufacturer in England specializes in basket-like coffins made of a traditional willow wicker, while a Swiss entrepreneur advocates the Peace Box, a cardboard coffin made principally of recycled materials. 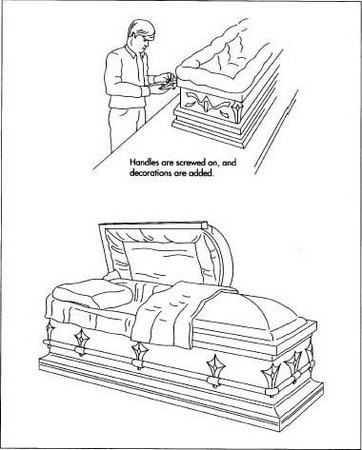 Raw materials used in casket making vary greatly. The Peace Box is made from card-board, and a deluxe coffin for a head of state may be made of solid bronze. Wooden caskets may be assembled from pine boards, or use an expensive hardwood such as cherry or mahogany. The most common American coffin is made from steel. Still others are made of fiberglass. Most caskets, except for the most simple, contain, in addition to the outer shell, an inner lining. This is typically made of taffeta or velvet. The lining may be backed with a batting material, usually polyester, and cardboard may back the batting. Other materials used in the manufacture of coffins include steel or other metals for hinges and accessories; rubber, if a gasket is used to seal the coffin; and paint. A wooden casket can be manufactured in any woodshop, using cabinet-making tools and techniques. Ambitious consumers can make their own, just as some people make their own bookcases and coffee tables. A typical small casket manufacturer is more often a casket assembler, buying prefabricated parts and putting them together. The three essential elements of the coffin are the shell, the lining, and the handles and accessories. The metal is cut into large blanks by a blanking machine. The blanks are then fed into a die stamper, which stamps the parts of the coffin shell. The parts are welded together and the fabric liner is added. A small manufacturer may buy casket shells in a semi-finished state from a casket shell producer, and finished linings from another supplier. The manufacturing process might then consist of painting the shell, stapling or latching the lining into the interior, and then screwing on handles and any additional hardware such as decorative corner pieces or latches. Large casket manufacturers do all the manufacturing and assembling under one roof. The following description is of the process for a typical steel coffin. 1 Steel caskets are typically made of 18-or 20-gauge steel, which is delivered to the manufacturer from a steel producer in coils. A small coil may weigh 1,000 lb (454 kg), while the largest may weigh up to 20,000 lb (9,080 kg). The steel coil is first sent through a leveler, which straightens it. Then the metal is cut into large blanks by a blanking machine. The blanks are then fed into a die stamper, which stamps the parts of the shell. The parts are then passed to a welding area. In the welding area, workers feed the parts into an automatic welder, which welds together the body of the coffin. The tops are also welded this way. Then a worker welds by hand any areas the welding machine did not cover. 2 The shells are then passed to a painting area. Workers apply paint using a spray gun, with a continuous supply of paint piped in through hoses. First the shells are sprayed with primer, next with paint. Then the caskets are baked, to set the paint. Other industries use similar painting processes. The paint used for steel caskets is unique, and specially formulated. 3 At this point, the lids are ready to be assembled to the shells, and hinges and handles are screwed on. Hinges are usually made of steel. A worker welds these on by hand. Workers then attach handles. These are usually preassembled, either at the casket manufacturer or at a supplier's facility. They attach simply, either by snapping into place or with screws. Next, decorative pieces, such as corner plates, are attached in the same way. Decoration and handles are added to the outside of the coffin. the taffeta. Taffeta and batting are then attached to a cardboard backing. Then workers fit this three-layered upholstery into the finished shell. The upholstery may be glued or stapled to the shell, or it may be designed so it simply snaps into place in the shell. 5 After the coffin has passed a final inspection, it is sent to a packaging area. Coffins are prone to scratching, so care is taken to package them well. The finished caskets are first wrapped in large sheets of packing paper to protect the finish from rubs and scratches. The corners are given additional padding. Then the casket is put in a clear plastic bay. After this, the bag-covered casket is covered with a plastic shrink-wrap. Before shipping, the casket is wrapped in a rug similar to a mover's blanket. Caskets are then taken by truck to warehouses for distribution. Workers inspect coffins for defects at several points during the manufacturing process. When the steel comes into the factory, it must be inspected to insure it is the proper gauge and quality. Workers check the parts of the shell after they are stamped, and inspect again before the shells go to the painting area. The shells are checked again after painting, as this is particularly important to the final appearance of the casket. The upholstery and accessories have their own quality checks. Then the finished product is examined carefully before it is sent to the packaging area. In the United States, cremation is becoming increasingly prevalent, and the demand for coffins is not growing. Future developments in the industry might lie more in the realm of marketing than in the actual manufacture. Traditionally in the United States, coffins are purchased only after a death, usually as part of a burial package offered by a funeral home. Consumers who purchase a coffin directly from the manufacturer are able to reap significant savings by foregoing the middleman service of the funeral home. Since the mid-1990s, many small coffin manufacturers have boldened their efforts to reach consumers. Another growing area is funeral insurance, which covers the cost of a funeral-including casket-for the policy bearer, upon the bearer's death. Though marketing caskets may grow more sophisticated and competitive, the actual technology used in their manufacture is relatively simple, and does not seem prone to quick changes and development. Colman, Penny. Corpses, Coffins and Crypts. Henry Holt, 1997. "Cardboard Coffins." UNESCO Courier (March 1993): 26. French, Howard W. "A Whimsical Coffin? Not Just for Chiefs Anymore." The New York Times (December 18, 1995): A4. Friedman, Dorian. "Caskets: Compare and Save." U.S. News & World Report (June 2, 1997): 10. Lubove, Seth. "Dancing on Graves." Forbes (February 28,1994). hi i was wondering if you knew about a machine that makes wood coffins and how much it would cost? thanks. I am looking for plans or measurments for a 1860,s style coffin.Any help would be helpful. Hi, I am planning to manufacture coffins as a business and to help my people that can't really afford expensive one, please help me with some good ideas and how to find the right tools and all that for this plan, appreciated thanks.